A sharps container is specific container that is reinforced and used to properly dispose of medical and veterinary needles, along with other types of Sharps listed here. The FDA recommends that used needles and other sharps be placed in sharps disposal containers immediately after use. Appropriate Sharps disposal containers are available through pharmacies, medical supply companies, health care providers, and online. 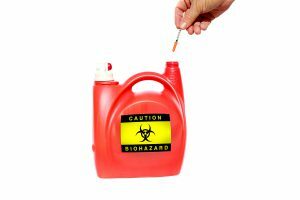 The FDA has cleared certain types of Sharps containers for use by health care professionals and the public to reduce the risk of injuries and exposure to infectious waste from used Sharps materials. These containers are made from rigid plastic, and are marked with a line that indicates when the container is full. Sharps disposal is generally regulated at the county and local levels- the state you live in may dictate what you can (and can’t) use for proper Sharps disposal. Single use Sharps Containers- Which are disposed of with the waste inside. This can include containers for mailback programs or ongoing service depending on how often you need your Sharps containers picked up and discarded. Reusable Sharps Containers– Which are emptied and sterilized before being returned for re-use. Approved Sharps disposal containers and specially designed to safely store sharps, as long as they’re used properly. If you need Sharps Containers and safe Sharps Disposal, Medical Waste Pros can help! Fill out the form to the right and we’ll get you connected with a Sharps container provider today. They offer a variety of sizes and capacities- they’ll help you determine the right system that works for your needs, whether you need Sharps disposal at home, or you’re a medical facility that needs regularly scheduled disposal. We service Sharps mailback programs that allow you to properly package the container in a specified return box, attest to the contents by signing a manifest, and hand the box to a UPS driver or postal carrier for delivery. Size- you needs will depend on how many times you use Sharps items- the more you use, the larger your container should be. Don’t skimp on the size to save money- you’ll end up spending more to have it disposed of properly twice as often. Safety- Your sharps container needs to be durable, puncture, and leak—resistant, and difficult to re-open. Convenient design- Find the right system that works for your needs- by understanding what types of waste you have, you’ll be able to select a system that’s easier to manage. Disposal– The type of container you select or purchase depends on how you plan to dispose of it- you can find systems that can be mailed (where the shipping return is included in the price), or an ongoing container service that will pick up your Sharps waste and dispose of it properly. No matter which system you choose, Medical Waste Pros has someone in your area to help. Get a free quote today! Medical Waste Pros will connect you with a safe, reliable local Sharps disposal provider to help you purchase a Sharps Disposal Container for your needs. They can recommend the best disposal system for your needs, from a mail-back system to regularly scheduled pickups. What you need really depends on how much and how often you need medical and hazardous waste disposal. To get started, fill out the form to the right, or give us a call at (888) 755-6370. Within minutes, we’ll get you free, no obligation quotes within minutes!